Fall is around the corner, and I’m not ready to give up my gardening just yet. 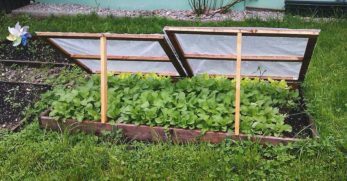 So what do you do when you see the cold weather coming, but you still want to produce your own food? Well, you plant more food, of course. But which plants can you grow in the fall? 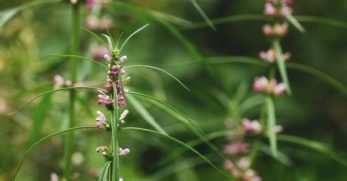 I’ve got that answer for you, and probably much to your surprise, there is still quite a variety that can be grown in autumn. Do you enjoy the delicious taste of broccoli? I love broccoli and cheese casserole so you know I love the stuff. I also love broccoli and cheese soup, roasted broccoli, and broccoli and cheese rice. But a lot of kids even enjoy broccoli because of its unique shape. They look like little tiny green trees that just happen to be packed with vitamins and nutrients that our bodies need. Brussel sprouts were once the dreaded vegetable of choice, but then people learned different and delicious methods to prepare them. Now, they are amazing! So if you haven’t tried Brussel sprouts in a while, use a different recipe and give them a whirl. 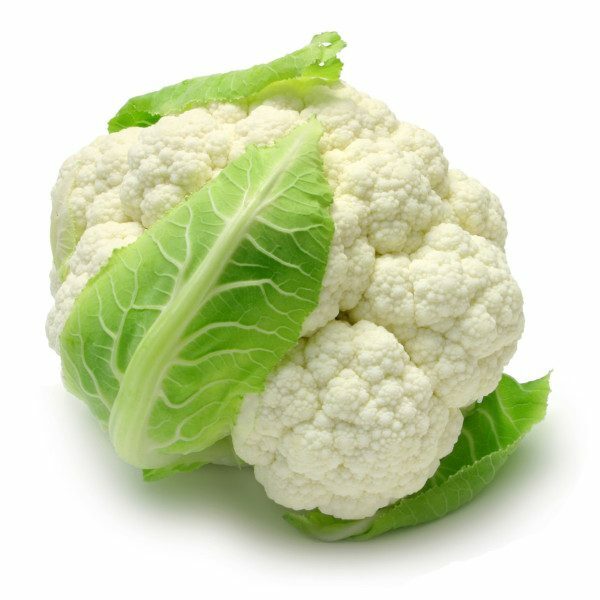 Cauliflower is another vegetable that was once kind of dreaded but has since been revamped to where people actually enjoy it now. Did you know that cauliflower has become the new low carb potato? It can be used in so many ways, who wouldn’t want to grow it themselves? I love rhubarb. It is the only vegetable that I know of that I can mix with fruit and make one killer dessert. So any vegetable I can turn into a dessert goes on my list of great veggies. 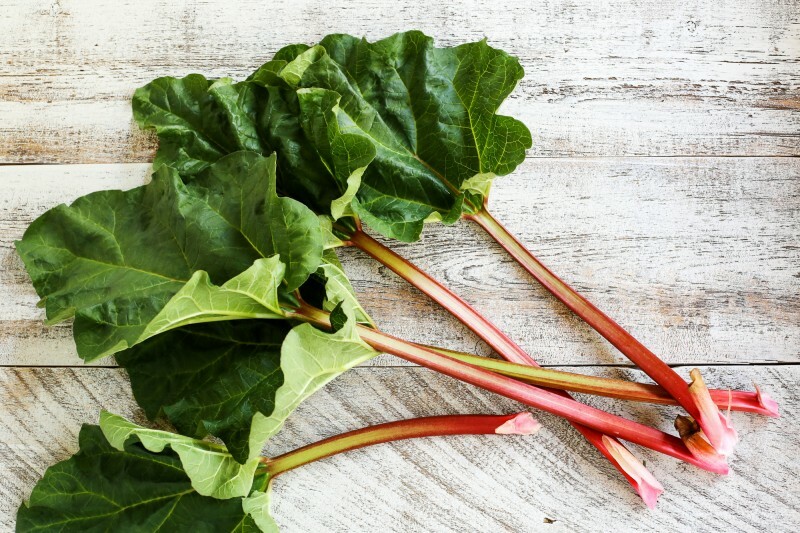 If you have a sweet tooth too, then you may want to consider growing rhubarb. Cabbage is a very versatile plant. There are different colored varieties that go well with many different dishes. 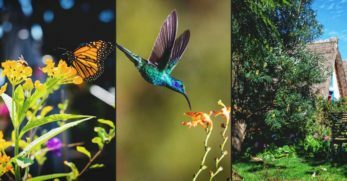 It comes in greens, whites, and purple colors which are also good for you because the more colorful a diet we eat, the more nutrients our bodies get as well. 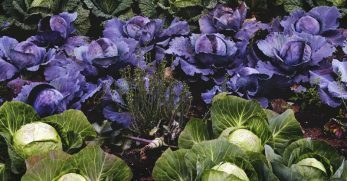 So if you love dishes like stuffed cabbage or coleslaw, then you’ll definitely want to consider adding cabbage to your fall garden. Your body will be grateful for the added nutrition as well. 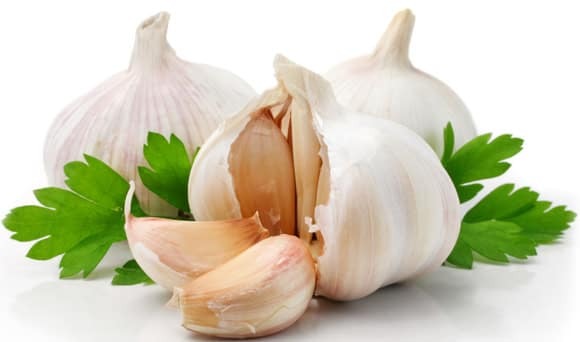 I absolutely love garlic. It is so amazing in most dishes. Garlic also has a ton of health benefits too. 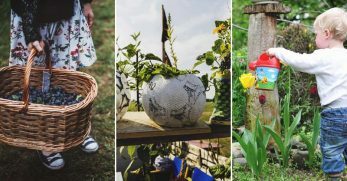 So if you’d like to learn how to make garlic a part of your garden, then you’ll want to check out this resource. My husband loves beets! He is very specific on how he likes them fixed though. 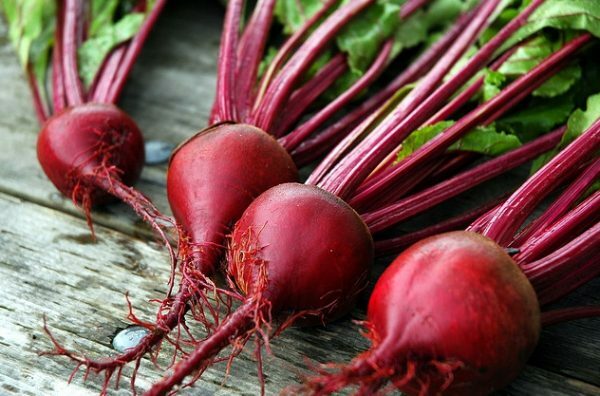 If you love beets too, then you’ll be happy to know that it can be part of a fall garden. But for those that are particular about how they like their beets fixed, you may want to try pickling them. That is how my husband absolutely loves his beets to be prepared. 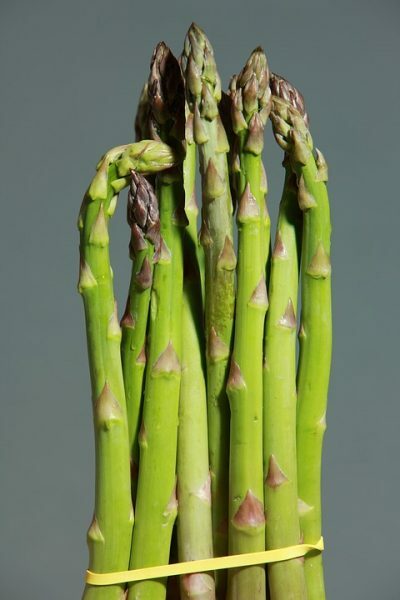 Asparagus is a fun vegetable to plant. I say this because it takes it a couple of years to really take off, but once you’ve got it going, it will return bigger and better with each passing year. Plus, it looks really cool planted along a fence line. It pops up, looks very unique, and pretty too. So give it a go if you enjoy making dishes from asparagus. 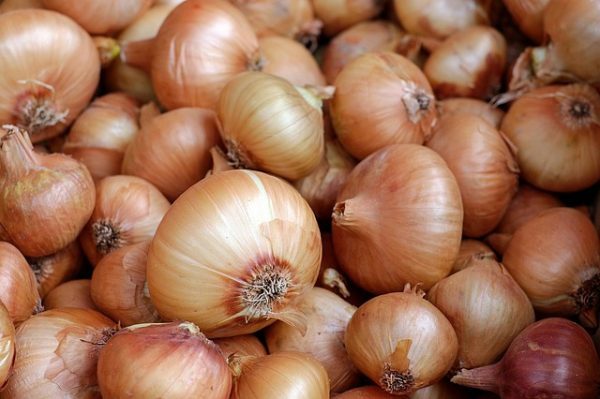 We are an onion family. I know a lot of people don’t like onions because they make your eyes water when you slice them. But they taste so delicious on a homemade cheeseburger, they are wonderful sautéed, and they are delicious when transformed into a blooming onion. 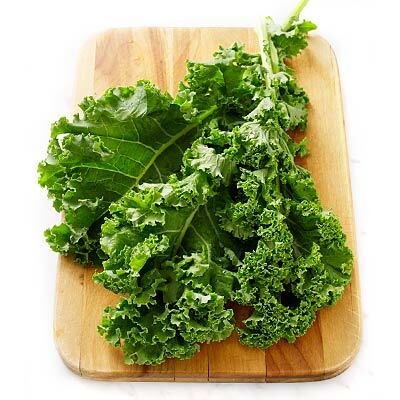 Kale is a superfood. Even if you don’t like it, that fact alone is enough for you to at least try to figure out how you can grow it and fix it to where you’ll eat it. But if you love kale anyway, then you’ll be happy to know that it can be grown in the fall. Then you can toss it right into a smoothie to get all of the benefits without really tasting it. When you think of the fall, you probably think of potatoes. 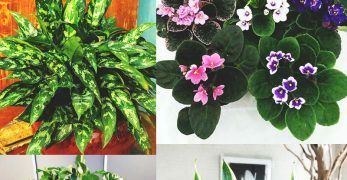 We’ve shared here how you can grow them and hopefully find great success. 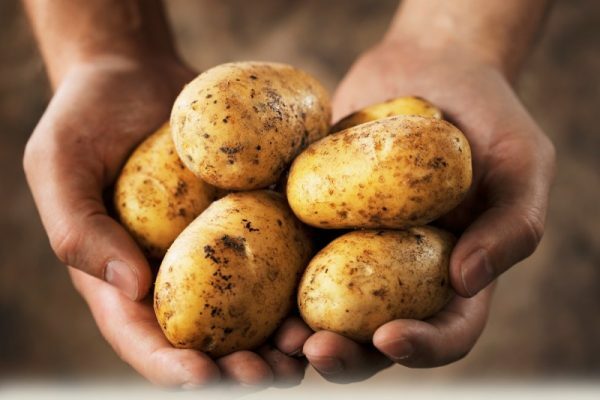 But potatoes are also a great addition to your fall garden because they can be stored in a root cellar and utilized all winter long. 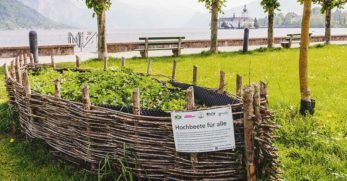 Not to mention, they are hard to get bored with because of how many different varieties you can grow and also all of the different ways you can prepare potatoes. You can get a lot out of one veggie this fall if you plant potatoes. You may do a double take when you see that green beans can be grown during the fall, but they can. There are certain varieties that do better than others. 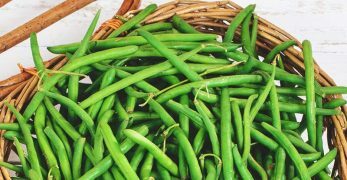 But beans are usually great producers so you could have quite the harvest from a vegetable that doesn’t require much room. Turnips are another vegetable that you either love or hate. They have a very distinct flavor that a lot of people actually love. But even if you don’t like the turnips themselves, you could still eat the greens and use the turnips as animal feed. Celeriac is a different vegetable. 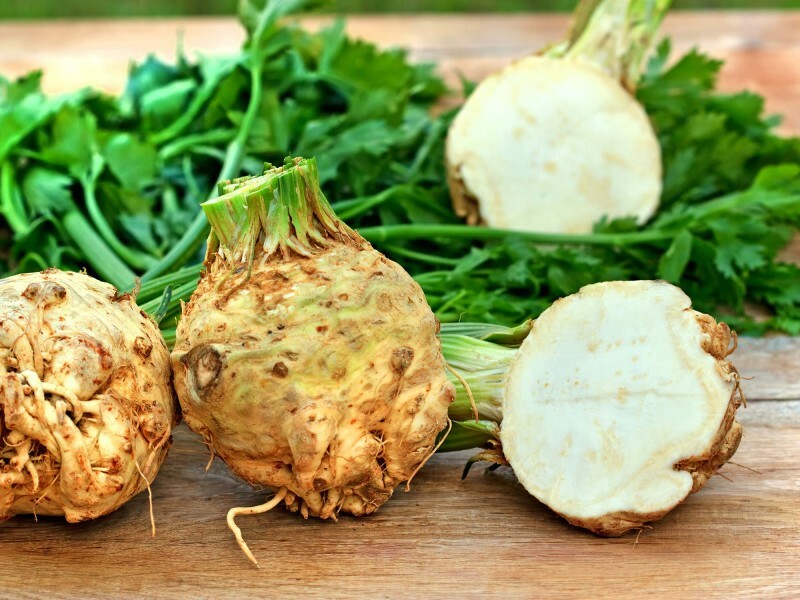 Most people have heard it referred to as celery root. It is a celery ball that grows under ground. But it can be grown in the fall since it is a root vegetable. 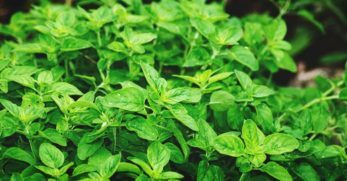 You can enjoy it raw, or cook it and use it in a warm soup or filling stew. I’m a collard girl. I love them with some fresh pintos, cornbread, and some fat back. That is a great southern meal in my eyes. But collards are very healthy for you when cooked that way. However, I always add some onion, vinegar, and fat to the mix to make them extremely flavorful. 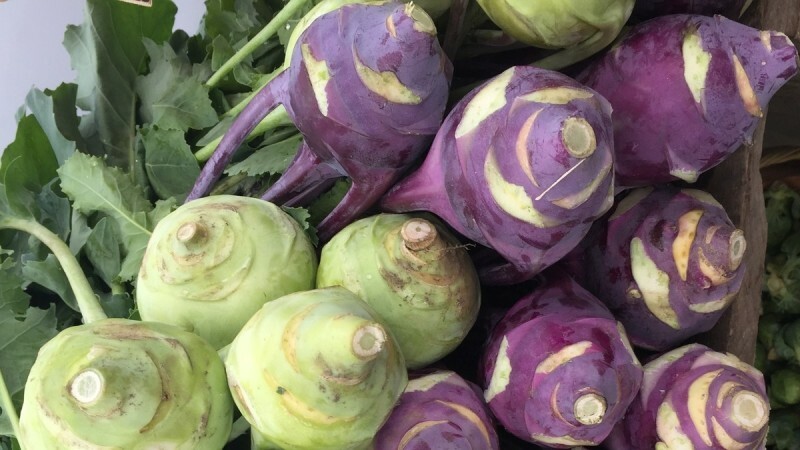 The first time I saw kohlrabi I almost laughed. It is unique in appearance and the name sounds kind of funny too. But you can actually use it for various types of dishes. Plus, it can be grown in the fall since it is a root vegetable. 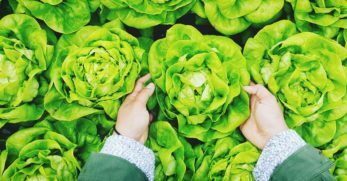 Lettuce is one of those vegetables that can be grown during most of the cooler seasons. It can even be grown in a greenhouse over winter, in most parts. 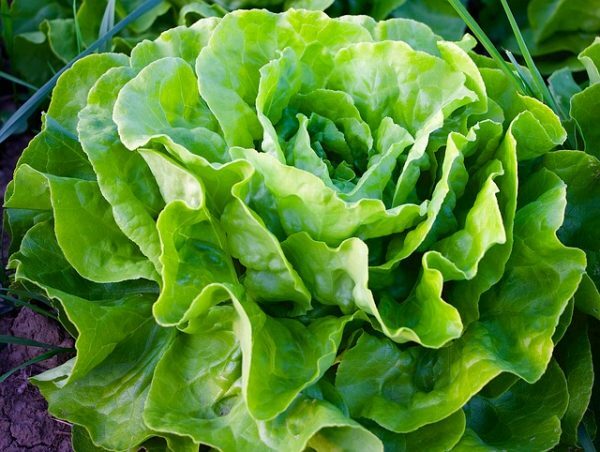 So if you love lettuce, then you’ll be happy to know that you can add it to your fall garden. There are many varieties of lettuce too so you’ll have lots to choose from. Most people are very familiar with carrots, but not so much with a parsnip. It basically looks like a lighter colored carrot. Plus, you can grow it in a container so it makes for easier growing. That also makes it perfect for growing in a smaller space. If you have a larger garden area, you could grow peas during the fall. In my experience, you have to plant a large amount to have enough to preserve. 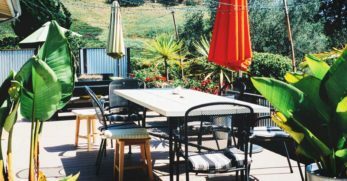 But if you are just wanting to plant a fall garden to eat out of, then this could still be a good option for someone with a smaller growing space. 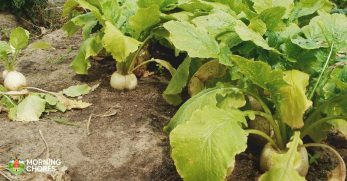 This would be a great vegetable to grow in your fall garden because not only can you eat and enjoy them, but they would also be a great way to produce a little extra income this fall too. So if you are looking for ways to make some extra money around the farm this fall, consider raising pumpkins. If you love pumpkin pie, then you’ll want to grow these too so you can make it fresh all season long as well. 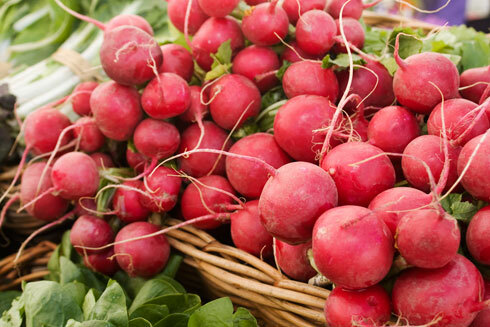 Radishes are a super fast vegetable to grow and produce. It only takes about 45 days to be able to harvest them. 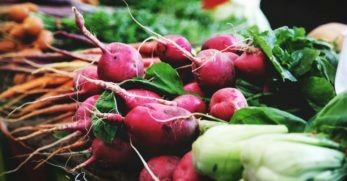 So if you like radishes to go in your soups or on your salads, then you’ll want to consider adding them to your fall garden. I’m so excited for fall because I get to grow carrots. They are a great vegetable to grow in containers so they are perfect for small grow spaces. 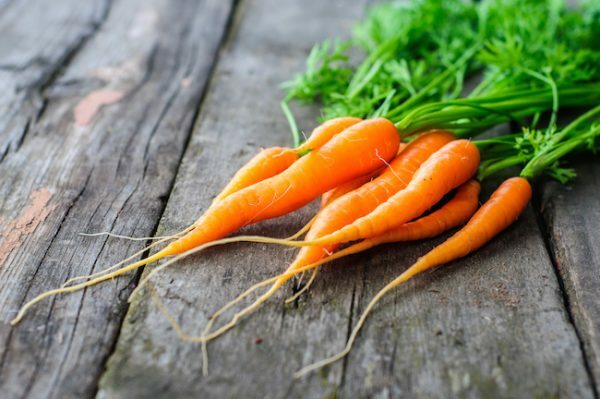 Plus, if you love carrots, you’ll be happy to know that with enough space or containers, you can easily freeze or can them to enjoy all year long. 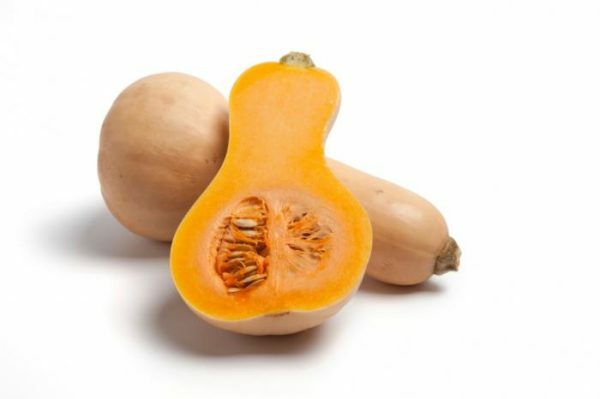 Butternut squash is becoming all the rage since people are beginning to ditch the carbs. It can be used to make all kinds of delicious dishes. So if you’d like to try a unique type of squash (and you want something you’ll enjoy in your fall garden), then you’ll definitely want to consider growing butternut squash. 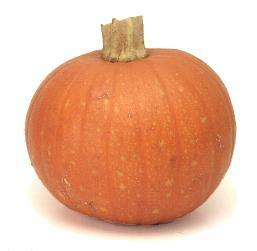 Acorn squash is another different variety of squash. It is a little smaller than other types of squash, but it can be used in different squash dishes and also included in fall décor as well. So whether you want to grow squash for food or décor, this might be a good addition to your fall garden too. Sweet potatoes are a staple in most homes during the fall season. People love to make sweet potato casserole and sweet potato pie. So if you love these dishes, then you’ll be very happy to know that you can raise them in the fall. 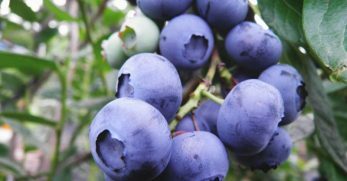 You can also grow enough to enjoy year round as they too can be easily stored in a root cellar. You might be thinking that all of this knowledge is great and all, but you’ve gardened all summer long. 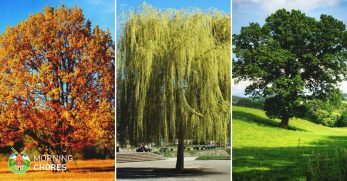 Why should you even bother with a fall garden? 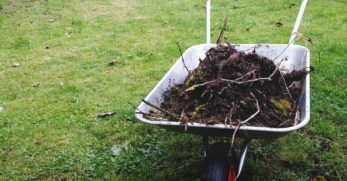 If you are like my family and try to put away as much food as you can for the winter, then you’ll be very happy to garden in the fall. It is my goal each year to have all we need before winter hits because my husband’s work load decreases over the winter months. In turn, that means we make less money. So I need all of our funds to go towards paying the bills. I don’t need to worry about how I’m going to feed my family. That is why I grow and preserve as much as I can while the seasons are right. Now, you may not have the same circumstances, but I’m sure we all like to save money. Well, what you grow and preserve will obviously cost much less than what you purchase at the store, and it is fresher too. So this is a great reason to consider having a fall garden. 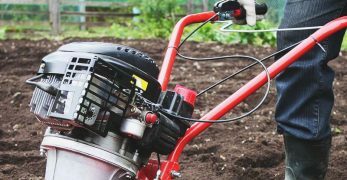 Another reason we garden in the fall is to help make extra money to add to our savings for winter. I find it ironic that the biggest holiday of the year falls around a time that a lot of families are struggling financially because if you work in an industry that is impacted by the weather, naturally, your hours are fewer. So in order to be prudent, you have to fill up the pantry and the savings account while you can. For us, this means growing things people want in the fall. 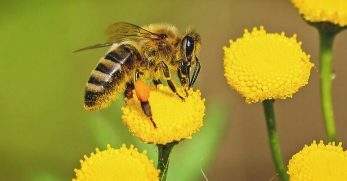 This could be pumpkins, mums, fall vegetables, or honey. Either way, that extra money can go towards your savings account, holiday funds, or anything else you need. 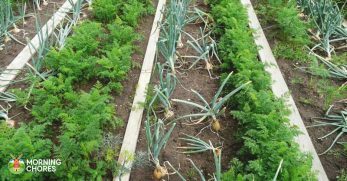 Finally, if you plant some of these veggies any other time of year you’ll probably realize that you are going to face certain issues. 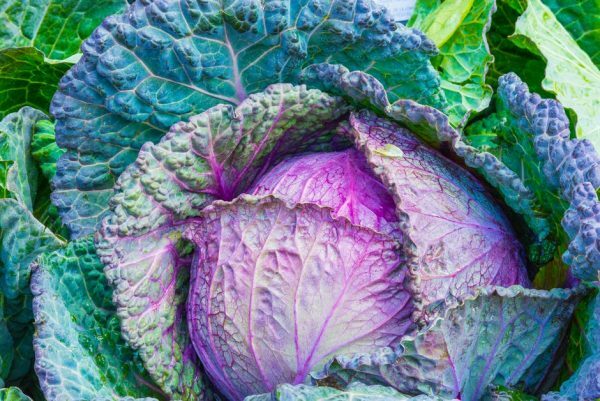 For instance, if you grow cabbage during warmer weather, you will usually have to fight bugs. Yet, if you grow them in the fall, the bugs are usually dead and will leave your harvest alone. 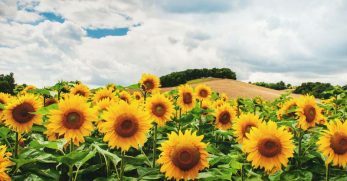 Other crops like broccoli, cauliflower, and lettuce don’t like hot temperatures. So they thrive the best in cooler weather. Therefore, planting a fall garden often means a much larger harvest because of the cooler temperatures. Well, you now have 25 different plants that you can grow in your fall garden. 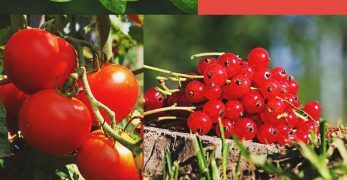 You also know some of the benefits of growing a fall garden too. But I’d love to hear from you. Why do you garden in the fall? 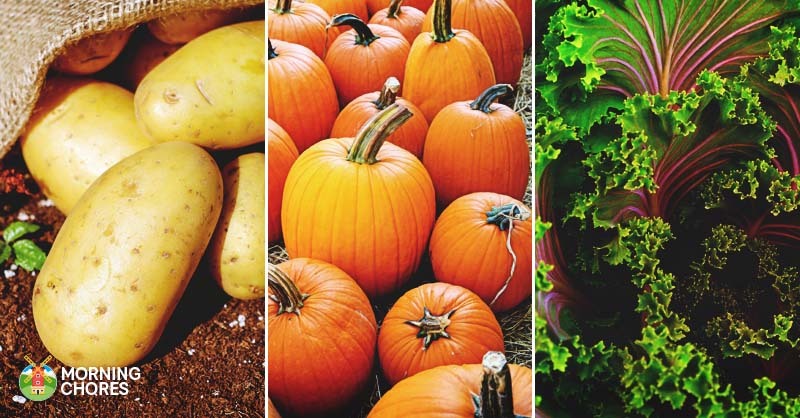 What is your favorite fall vegetable to grow?